János Mészáros gained his veterinary qualification at the Faculty of Veterinary Science of the Hungarian University of Agricultural Sciences in 1951. He then became successively Assistant Lecturer, Senior Lecturer and Associate Professor involved in teaching and research at the Department of Epizootiology of the University of Veterinary Science, Budapest (UVS). He served as department head (1963–1976) and Full Professor (from 1966) at the Department of Epizootiology of the UVS and as Vice Rector for Research (1967–1975). From 1976 to 1990, he served as director of the Veterinary Medical Research Institute of the Hungarian Academy of Sciences (HAS) in Budapest, and then worked as research professor until his retirement in 2004. He was elected Corresponding Member (1976) and then Full Member (1982) of the HAS. He has been Secretary (1962–1970), President (1970–1999) and Honorary President (since 1999) of the Academy’s Committee of Veterinary Sciences. In 1959 he was a founding member of the Hungarian Veterinary Poultry Association (HVPA), and served as its President for 50 years. He was present at the meeting in Utrecht when the WVPA was founded under the leadership of Professor de Blieck. The Hungarian Branch has participated in the work of the WVPA and has attended the international congresses of the WVPA ever since. Since 1993, the annual symposia of the HVPA have been organized as two-day conferences named ‘Derzsy Days’, attracting as many as 250–270 participants with lectures given by the world’s most distinguished poultry scientists. In 1997, Budapest hosted the XIth International Congress of the WVPA. 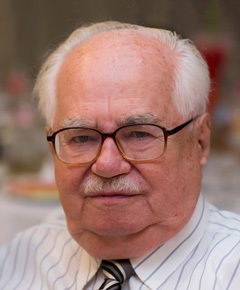 At that event, the WVPA elected János Mészáros as Honorary Life President. He received the Excellent Innovator and Inventor gold medal and a shared State Prize (1983) for his work on poultry virus diseases. He was elected an honorary citizen of his native town, Nádudvar (2000) and awarded an Honorary Doctorate by Szent István University (2003). He has published 210 scientific papers and 62 educational articles. In his youth he won long distance running competitions. He loved poetry and knew several poems by heart. He leaves behind his wife, two children, four grandchildren and three great-grandchildren.